Candy Corn is my weakness! If you mix them with salted peanuts in a container, and let them sit for a few days, it will taste like a payday candy bar, another weakness! Payday candy bars and candy corn are my two favorite candies. I no longer eat candy corn and paydays, and I hear that in Germany candy corn is a banned product. It seems the yellow food dye causes cancer. 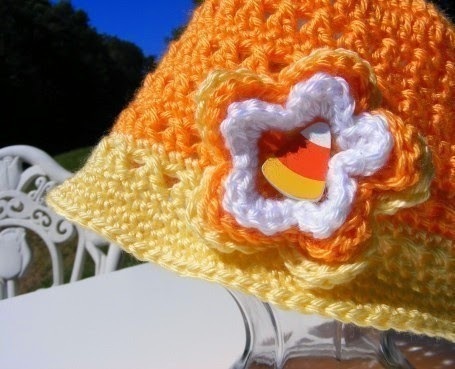 OH WELL…if you can’t consume candy corn, why not indulge in Candy Corn Crochet!!! Every year I come up with a Candy Corn design, and this year it is Candy Corn Shoes, and here is the pattern for you to enjoy!! Option2; This is the edge on Candy Corn shoe; CH 1, SLP ST in joining st; *CH 1, SLP ST in nxt st* Complete sequence between * * in each st around; join w/SLP ST at base of beg. joining ST; fasten off, weave in ends. 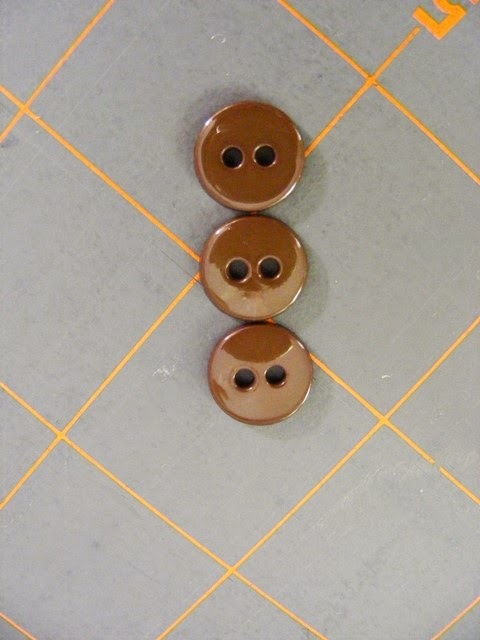 Lay three buttons on a table or mat, lining them up evenly so that they are lightly touching, making sure to line up all holes evenly. 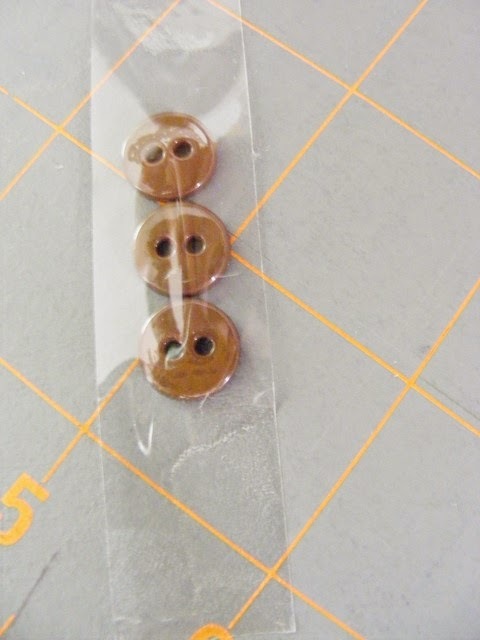 Tear off a 6” piece of scotch tape, and place over the buttons, as pictured below. Then pick up the scotch tape, with the buttons sticking to it, and place the tape with buttons, in position on the shoe, in the place that you desire. 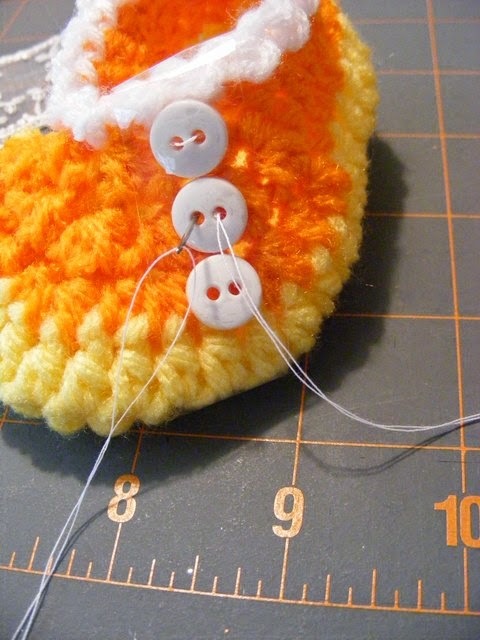 Thread your needle and tie a large knot in your thread tail, to keep it from pulling through, and proceed to sew the buttons in place, leaving the scotch tape intact, to keep the buttons from moving. 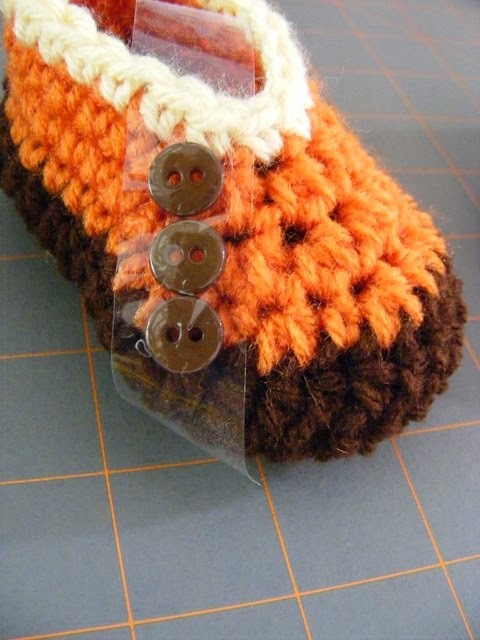 (I will take a stitch in each button at the beginning, this holds them in place better, because they can still shift and move even with the tape application) When you are finished sewing on the buttons, gently peel the scotch tape off of the buttons and shoe. I hope you enjoyed this pattern! 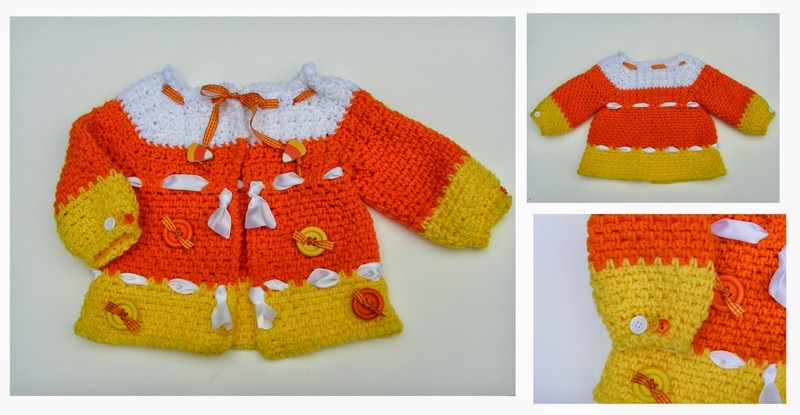 Make sure to follow my blog, as I will be posting new patterns in the future! 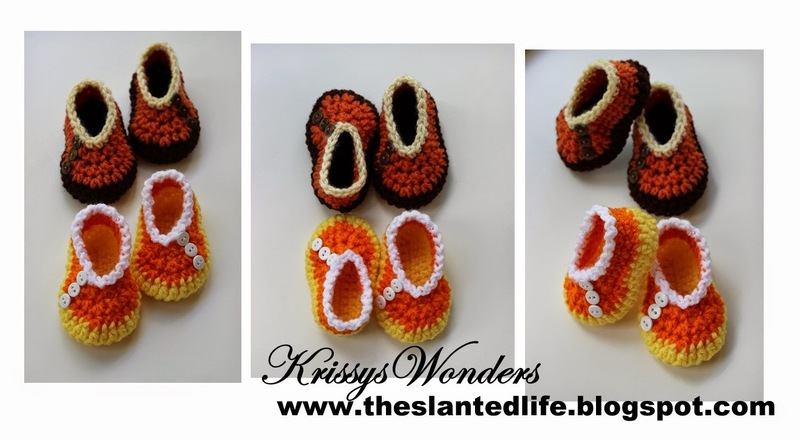 I hope you enjoyed the free candy corn shoe pattern. I would love it if you and your friends would join me on my Facebook page! 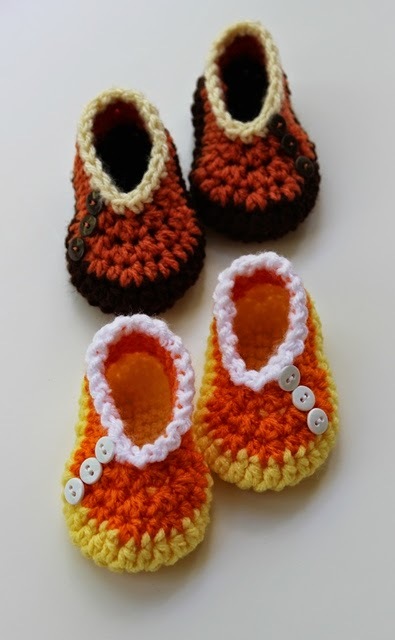 Please follow my blog, so you don’t miss out on new and upcoming crochet patterns, because I am off to design a pair of pumpkin shoes! 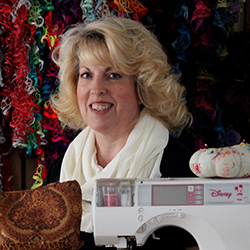 Thank you, Kris, for sharing your pattern. Made them up in a jiffy. Instructions were clear and easy to follow! !